Close to one fifth of new properties in Sydney are being bought by wealthy Chinese investors and the flood of money is set to continue. A generation of Australians are being priced out of the property market. 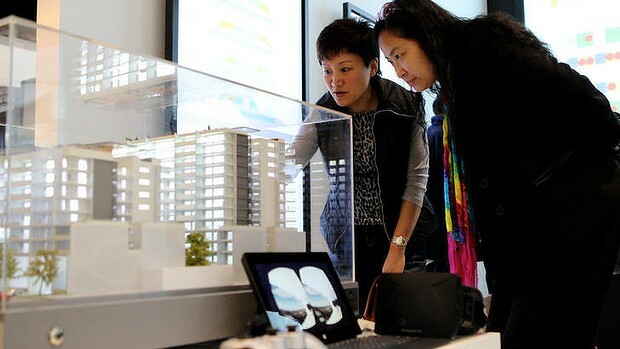 Chinese buyers are keen on east-coast property.‘‘A generation of Australians are being priced out of the property market. Many face a life time of renting,’’ Credit Suisse analysts Hasan Tevfik and Damien Boey said. There are currently 1.1 million millionaires in China who could easily afford properties in Australia’s two most expensive markets, Credit Suisse says in a research note. Wealthy Chinese buyers have purchased $24 billion of Australia housing in the past seven years, and over the next seven years an additional $44 billion will be spent on residential property, Credit Suisse estimates. 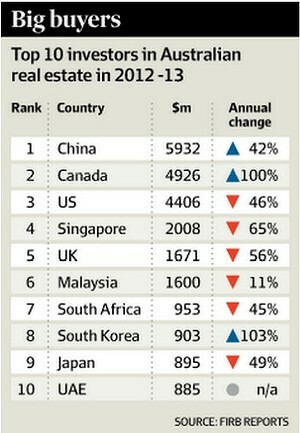 Chinese top the list of foreign investors in Australian residential property. There was $17.2 billion worth of approved residential property investment coming in down from $19.7 billion in the previous period, according to the Foreign Investment Review Board. Of the 2013 total, $5.6 billion was approved for residential properties in New South Wales. That number may seem large, but across the whole property market the effect dissipates. There is, on average, a 6 per cent turnover annually in Australia’s property, according to the Reserve Bank of Australia. The total value of Australia’s property market is $5.02 trillion, according to the ABS, so yearly turnover in the housing sector would is roughly $360 billion. Chinese buyers are currently spending $5.4 billion a year on Australian properties, Credit Suisse said, with the split relatively even between new settlers and others, which include investors, developers and temporary residents. The rise in domestic house prices, while marginally impacted by Chinese investors, is a result of low interest rates, increased affordability and domestic investors, not foreigners, said Deutsche Bank economist Phil O’Donaghue. ‘‘The point that gets lost in this debate very often is that nobody focuses on the rules, which are pretty clear for a foreign investor. The principle that guides the FIRB policy is that foreign investment should increase the housing stock,’’ Mr O’Donaghue said. Chinese investors may be pushing new house prices higher, which is locking out local first-home buyers, but they are not the reason for rises in second-hand home prices. That doesn’t bode well for first-home buyers who struggle to break into the market. First-home buyer activity, as a proportion of total borrowers, is near record lows at 12.7 per cent of total loan approvals, according to the ABS. First-time buyers in February comprised less than 10 per cent of all mortgages processed by mortgage broker AFG for the first time since June 2010. The numbers are the most dramatic in NSW where first-home buyers make were responsible for just 3.4 per cent of AFG mortgages, down from an already very low 4.5 per cent in February last year. Victoria’s first-home buyers took out 10.3 per cent of mortgage, down from 17.1 per cent last February. Over the last 12 months, property prices in capital cities have jumped 10 per cent, according to the RPData-Rismark home index. The rise was most severe in Sydney, where prices rose 14.6 per cent, pushing the median house price to $746,640. 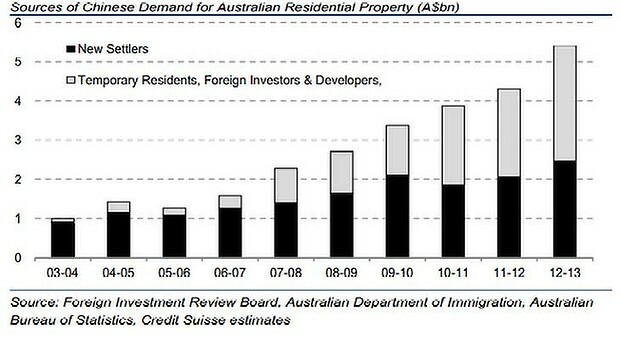 The figures presented by Credit Suisse might even understate the true picture of Chinese investment in Australian property. That’s because there are alternative means to do so which fall outside of readily trackable measures of this trend, such as when a Chinese national provides the money for an Australian-based family member, friend or solicitor to purchase a property. “Or when an Australian citizen sells her apartment in Shanghai and switches into a Melbourne Docklands flat,” the strategists said. The four measurable routes to the so-called “Quarter Acre Dream” are a Chinese citizen buying off-the-plan in Australia with FIRB approval; a Chinese citizen with temporary residential needs buys a house through the Significant Investor Visa scheme ($5 million and higher); purchase of a property for redevelopment purposes by a Chinese citizen through FIRB approval; and finally, Chinese settlers with permanent residential status who doesn’t need purchase approval.